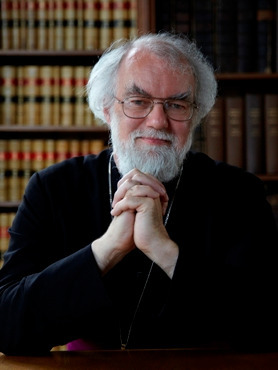 In this article I take a look at Rowan Williams' poem Winterreise: for Gillian Rose, 9 December 1995 which forms the text to my song Winter journey which features on the new disc of my songs, Quickening, for which we are currently crowd-funding. Williams' poem was written in response to the death of his friend Gillian Rose, a Jewish philosopher and critic who was baptised on the day of her death, and was originally published in his collection Remembering Jerusalem (2001) and is currently available in The Poems of Rowan Williams (Carcanet Press). Talking of his poetry, Williams has said that 'I dislike the idea of being a religious poet. I would prefer to be a poet for home religious things mattered intensely'. His poetry has been described as 'visionary yet earth-rooted' with a genius for embodying abstract ideas. The main subject of Winterreise: for Gillian Rose, 9 December 1995 is a journey which Williams made to go to the bedside of Gillian Rose, who was dying; a problematic and complex journey full of missed connections. The poem is structured in three, Morning, Afternoon and Evening, and around the harness of the journey itself Williams weaves recollections of events and ideas arising from the journey, and from his relationship with Gillian Rose. Whilst recording my setting, with baritone Johnny Herford and pianist William Vann, we found ourselves often coming back to the allusions in the poetry, teasing out references and emotional contexts. The flat fields tramp towards the Severn. their edge, only the sand and the wet still sheets. of icy fog stand between fields and water. I can't really explain why I set the poem, as with many of my songs it was simply something in the text which drew me. I had acquired the book of poems out of curiosity and found the text of this particular poem particularly appealing.